Baking in this house requires organisation because the 2 year old understands when I’ve something baking. He likes to sit in front of the oven and demand instant results. His naps are beginning to shorten too so if I want to bake I need to be able to lash a cake batter together rapidly and have it cooked and cooling by the time he wakes up. This toddler (is a 2 year old still a toddler?) is going to be the death of me. Yesterday morning he learned how to climb out of the cot by himself. By last night he was climbing out everytime I put him to bed. In fact the last few occasions, he climbed out and pressed the “call” button on the monitor in his room so that I’d put him back to bed. Thankfully there is a big-boy bed arriving for him later today and I may sleep a little easier. His big brother or sister never got up to the same amount of mischief as he does. I need eyes in the back of my head! If you’re interested in hearing some extra baking information you can click on my podcast below where I chat about baking with sour cream, the difference between egg sizes in the US & Europe, along with traditional Irish bakes. I am brutal at remembering to take the butter out of the fridge to soften. There’s no point in telling me to get a pre-softened butter or margarine as I prefer to bake with the real deal. Today’s bake however uses more sour cream than butter so it’s easier to get ready in a hurry. 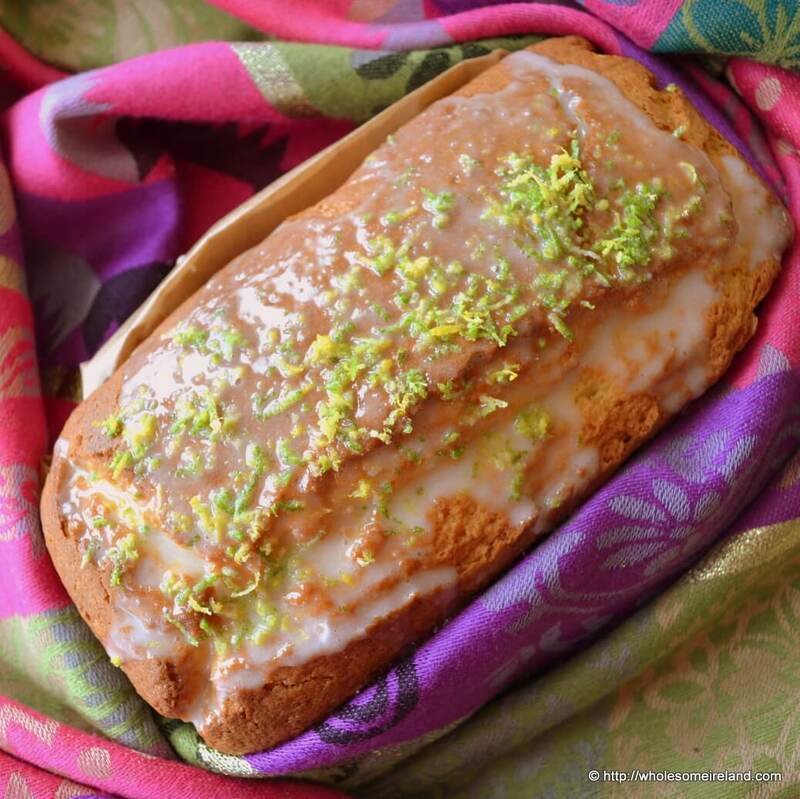 The flavours of lemon and lime get on so well with sour cream and the result is a lovely loaf cake that slices easily once it has cooled. Line a 2lb loaf tin well with greaseproof paper. Preheat your (fan) oven to 170 degrees Celsius. Beat together the butter and 175g (this means you must leave some for the glaze) of the crème fraîche until you get a loose mixture, stir in the caster sugar, then the eggs and beat again until it begins to dissolve. This mixture will be runny, don’t worry! Sift in the flour and baking power and beat again until you have a thick batter. Using a fine grade grater, grate in the rind of half a lemon and one lime. Juice the grated lime and half a lemon into the batter. Stir well. Pour the cake batter into the loaf tin and bake for 45 minutes in the preheated oven. After 45 minutes, insert a skewer into the middle to see if the cake is cooked. If it is clean then remove the cake and leave it to cool completely on a wire rack. If not, return the loaf tin to the oven for a further 10 minutes before testing again. When the cake is completely cold, grate the second lime rind and the other half of the lemon rind onto a saucer and set it to one side. Make the glaze by beating together the remaining crème fraîche with the juice from the second lime and lemon half along with the icing sugar. 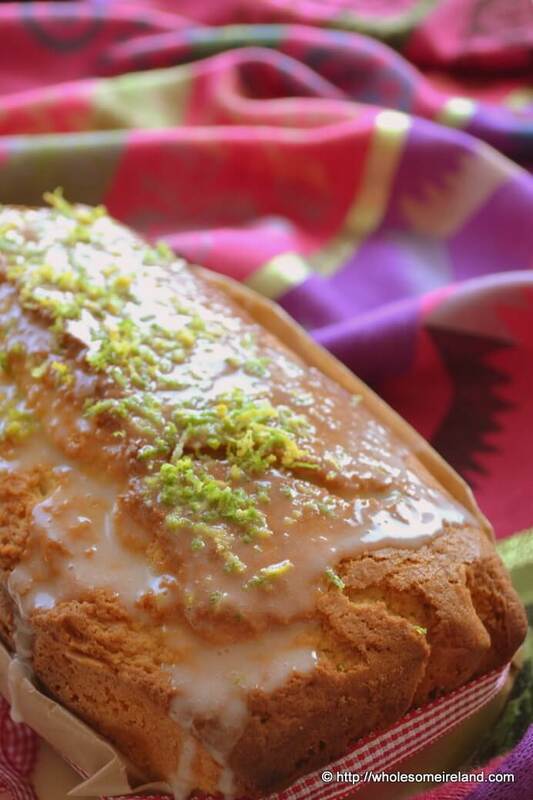 While the cake is still in the loaf tin, pour the glaze on top then sprinkle with the grated lemon and lime rind. Put the loaf tin into the fridge to chill for at least 2 hours before lifting out the cake and slicing – this will stop it from crumbling to pieces when you cut it. This cake will freeze extremely well, providing you don’t glaze it, the cake will last in the freezer for up to 3 months. Ensure it is well wrapped in at least 2 layers of greaseproof paper and then cling film. This cake looks suitably delicious! Have to try this… TODAY! I just love that about your son pressing the call button… absolutely priceless! Funny my 4 yo asked me this morning if his 2 yo cousin is still a toddler and what exactly is he? I told him that toddler covered one to two yos and he would probably be called a young boy (couldn’t say “Little” or he would have flipped! )… don’t know if this definition is right though? I’m forever having to nuke the butter for a few seconds because I forgot to get it out of the freezer, let alone the fridge. And I use Greek yoghurt almost interchangeably with sour cream/creme fraiche. I also use greek yoghurt a lot in baking, but this cake particularly needs the creme fraiche, I think it adds to the flavour and texture. I got the limes in Lidl a couple of weeks back, I couldn’t believe my luck. Bought a load and rammed them into the fridge. You know how it is! If I see them there again I’ll text you! Thanks Catriona I use creme fraiche quite oftee and never know it was known as sour cream aswell !! Recipe sounds fab , like you I’ll have to pick a good day (child free) to make it! That looks so delicious I must give it a try! I also found your Gur Cake recipe, thanks! I do hope your mischievous 2 year old is settling into his big boy bed. Fab recipe & def one I will have to try when my almost 2 year old is having her nap! Little tip I picked up somewhere to quickly soften fridge hard butter is to cube it & put into blood temperature water, works a treat! Oh sure I’ve been known to microwave it/stick it on top of the dishwasher while it’s warm/try loads of tricks. I think though if I don’t warm it naturally it makes for a different flavour! Thank you, I’m glad you do! I made this yesterday and brought it into work today. Gone in less than an hour and everybody loved it. Will definitely make this again as it was so simple. Ah that’s fantastic, I’m so glad you like it Karen. A great testimonial!